People who wouldn’t have considered riding a traditional bike are becoming electric bike (e-bike) riders. The electric pedal assist boost gives people the ability to flatten hills, travel longer distances or bike while carrying groceries or a child. E-bikes provide people new opportunities to enjoy the benefits of riding a bicycle. The growing availability and improved technology of electric-assist bicycles is reflected in the demand as e-bike sales are up more than 450% since 2013. Due to the excitement and demand around e-bikes, in early 2018 the Washington State Legislature passed SB 6434 which establishes a legal framework consistent with national standards and gives the e-bike industry certainty in the Washington market. The new law also provides users with a clearer understanding of where they can and cannot be on bikeways, trails and streets while ensuring that jurisdictions and agencies have the tools for enforcement and management of e-bikes on our streets and trails. Do you ride an e-bike in Burien? Here’s what you need to know (before reading all the nitty gritty below). WABI-ists Maureen Hoffmann and Rob Gala met with City of Burien Director of Public Works Maiya Andrews, and PaRCS Director Steve Roemer, to ask about the presence of specific e-bike regulations here in Burien. Therefore, within the City of Burien, Class 1 and 2 e-bikes may be used anywhere that a non-electric-assist bike may be used, subject to the same statewide laws… and of course, courtesy and safety. What about e-bikes on the regional trails nearby? Representatives from jurisdictions in King County have been meeting to compare notes about the use of e-bikes There are efforts underway to make regulations more uniform from one city to another; some of those efforts, however, are not scheduled until next year. King County Regional Trails has begun to compile the following chart. (As yet incomplete.) Click on the chart to enlarge it. New E-bike law in Washington state took effect on June 7, 2018. When did the legislation become law? The law was enacted June 7, 2018, with the requirement to label new e-bikes on July 1, 2018. Top photo of two cyclists and their bikes by Rad Power Bikes, Ballard, WA. 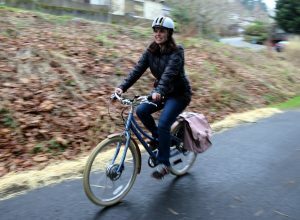 Second photo, of a woman on an e-bike by Washington Bikes.